Isn't 'Triad' a cute name? The word just reminds me of other words like ‘buttercup’ or ‘trifid’, in the way in which its construction manages to wrap itself around the vowels, as if two old friends were warmly embracing each other. However, we know better, right> We know that this is the name given to Chinese gangsters, as depicted in this film Directed by Andrew Lau and Alan Mak; and Starring Edison Chen, Shawn Yue, Anthony Wong, Eric Tsang, and Francis Ng. It was made in 2003, and lasts for 119 minutes. Seven years ago a Chinese crime lord named Ngai Kwun is killed under dubious circumstances, prompting his 'family' to fight back. Now this begins when his oldest son, Ngai Wing-Hau (Francis Ng), seizes power within the Chinese underworld, by blackmailing the ‘Big Four’ to be under his thumb. However, one of the ‘Big Four’, Sam (Eric Tsug), has plans of his own – because he employs a street urchin, Lau Kin-ming (Edison Chen), to act as a mole for him in the Chinese police force. And do you know what? Funnily enough, Hau’s half-brother, Chan Wing-ya (Shaw Yue), decides to turn his back on his family, and attempts to be a police officer too. Moreover, due of his family background, Superintendent Wong Chi-shing steers Wing's career path in another direction, by encouraging him to turn to a life of crime, so that he can infiltrate his brother Hau’s organisation and act as mole in turn. Four years later, and the state of play is somewhat different in the Chinese underworld. Wing is released from prison and he begins his penetration of his brother’s crime empire. Sam’s mole, Lau, has worked his way up the police force, and is now working with Superintendent Wong to take down Hau. And as for Hau, well, he has built upon his fathers empire, he has taken his brother Wing under his wing (no jokes necessary), and now he has plans of his own to become sole ruler of the underworld. OK, so how is he going to do that? Well, after he, his brother, and his main guard, are caught during a drug transaction, he has in place a number of schemes to help him with this ploy. (1) He sends Sam to Thailand to assist in another drug deal. (2) He has the other three of the ‘Big Four’ murdered by his men. (3) Whilst in custody, he shows the police, as well as his half-brother Wing, a video tape that proves Superintendent Wong was behind the death of his father, Ngai Kwun. And (4) He has Sam shot in Thailand. Oh! But wait! Their is more. Because once he is released from police custody, Hau gets his men to go on a murderous rampage, and enact retribution to all who have done him and his family wrong. Well, I suppose that is what what happens three years later, is a right pain in the Triad I can tell you. As justice is sworn - crime-bosses are reborn - ploys are just shown - and confrontations are blown. Do you know what? I have found that some sequels are really sh*t you know. For example, how movie makers try to take the same essence out of a films successor, and then distill it into a luke-warm script with similar character. However, there are a few exceptions to this rule, like 'Godfather Part 2', 'Gremlins: The New Batch', and 'Lethal Weapon3'(OK, maybe not the last one). But should I add 'Infernal Affairs 2' to this pantheon of filmic greats or not? Hmmmm? This film is just brilliant. 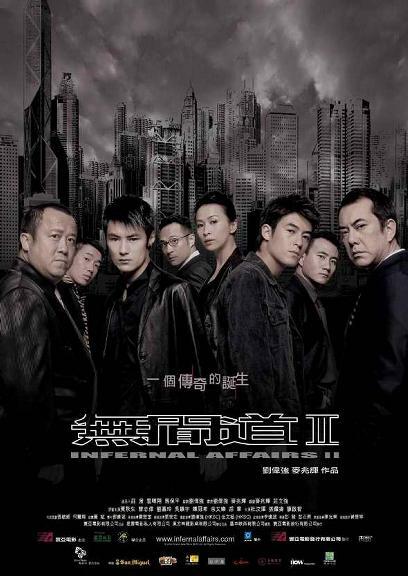 It has taken the basic premise of the first film (click here for review), used it as a sub-plot, and then plucked the second tier characters from ‘Infernal Affairs 1’ ( such as Superintendent Wong and Sam) and expanded upon their back-story in a new and innovative way. OK, I know that in these more modernist times, that this sequel would be classified as a prequel. And that the only drawback with this film is, is that this fact isn't really that obvious on first viewing - and you can be left wondering as to why these two guys are playing the same game as that did before. Well, they do call this ‘number 2’, so obviously you think that this is the next chapter, and not the previous one, correct? But apart from that little nag, though, the rest of the film is just super. The plot is complex yet evolving. The acting is mannered yet gritty. The cinematography is pretty yet not overtly stylized. And the music is harmonic yet contrasting. Honestly, I can not find any fault with this film what so ever! Because the ambiance it conveys is both stylistic and moody in tone, and is complemented greatly by an outré oriental cast. It is just one of those films that keeps’ on giving, thus allowing us to receive a much greater experience. 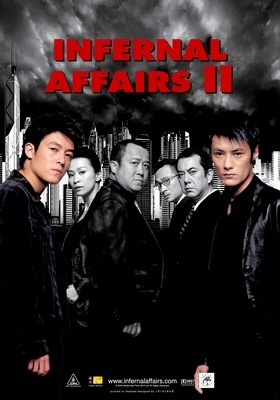 In many ways’ 'Infernal Affairs 2' does reminds me of the Godfather – especially the family aspect of it, and the way that it is told. And I would like to feel that it should be placed next to this masterpiece as another great crime film. Class Chinese Film - no compromise.